From this June through August, 100 Tonson Gallery and Raimon Land PLC presents the gallery debut of Unwrapping Culture, a contemporary performance by Pichet Klunchun, one of the most talented and critically celebrated multi-platform artists of the Thai contemporary art scene. 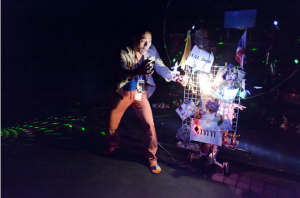 In this original solo project never before presented outside the theater, Pichet will lead his audience into profound traditions relating to “Thai identity” and “Thai culture,” with a performance that is both piquant and socially relevant. For those unfamiliar with this contemporary Thai master, Pichet is a dancer-choreographer who synthesizes the theory of traditional Thai dance with contemporary modes of interpretation and expression, thereby inducing audiences to enter into his thought processes and unique creative concepts. In Unwrapping Culture , Pichet will tell stories and offer social critique through a performance entailing body movement and emotional expression, and a styling of staging and lighting solely controlled by the artist's own actions. After receiving his degree in Thai Classical Dance at Chulalongkorn University in Bangkok, he pursued theatre both as dancer and choreographer at high-profile occasions. He has participated lately in several intercultural performing arts programs as a Thai representative and as an international dancer-choreographer in Asia and Europe. Also Pichet received several awards such as Silpathorn Award in Performing Arts (2006), ‘Routes’ ECF Princess Margriet Award for Cultural Diversity from European Cultural Foundation (2008), Citizen Hero Award from Sanya Dharmasakti Institute for Democracy (2009), and received award from the French Ministry of Culture "Chevalier of the French Arts and Literature Order" for his contribution to the influence of Culture in France, in Thailand and all over the world. Thursday, 20 June 2013, 7 pm. Friday, 21 June 2013, 7 pm. Saturday, 22 June 2013, 2 pm. Friday, 28 June 2013, 7 pm. Saturday, 29 June 2013, 2 pm. Friday, 5 July 2013, 7 pm. Saturday, 6 July 2013, 2 pm. Friday, 12 July 2013, 7 pm. Saturday, 13 July 2013, 2 pm. Sunday, 14 July 2013, 2 pm. Friday, 16 August 2013, 7 pm. Saturday, 17 August 2013, 2 pm. Friday, 23 August 2013, 7 pm. Saturday, 24 August 2013, 2 pm.